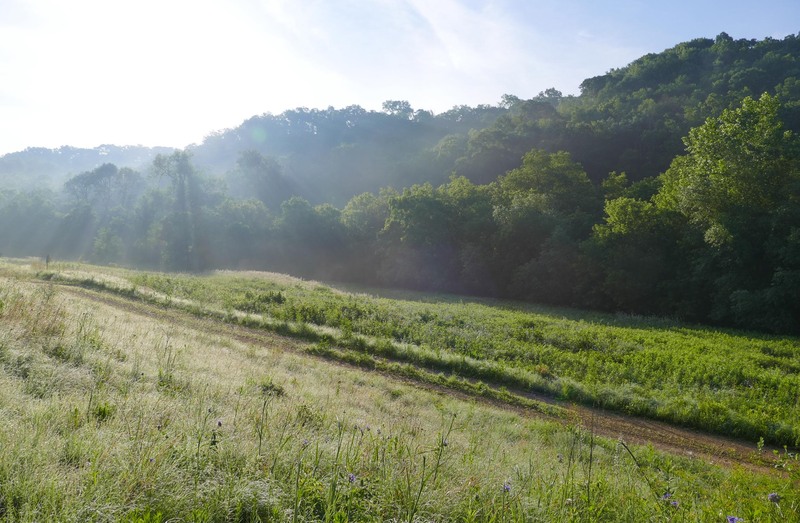 It’s been a busy July so far – lots of events and visitors and projects. And some very hot weather. 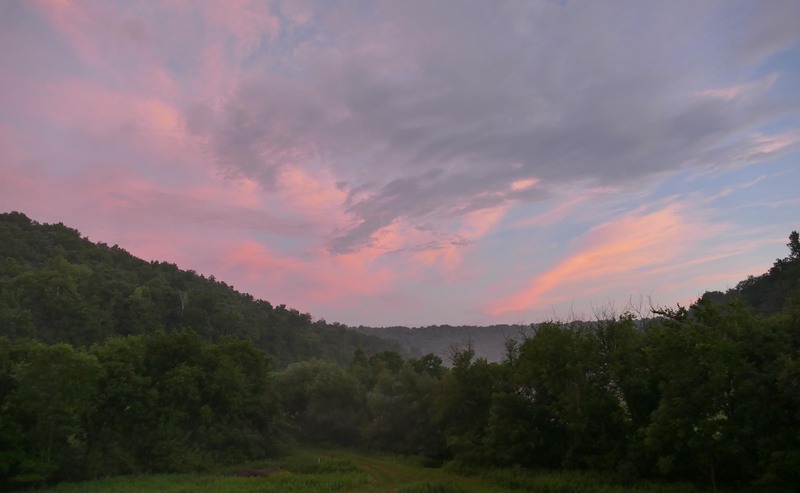 Hot and humid days mean that mist collects in the valley most mornings and evenings. 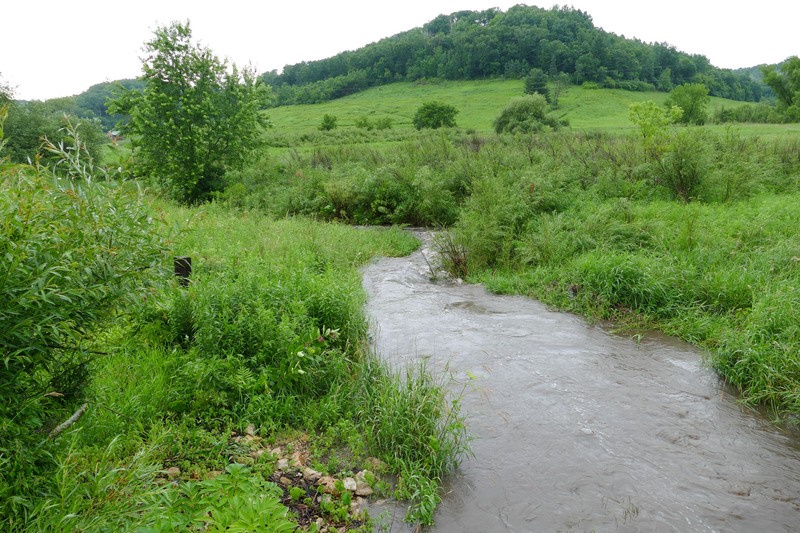 The creek has been full, but not flooding – yet. 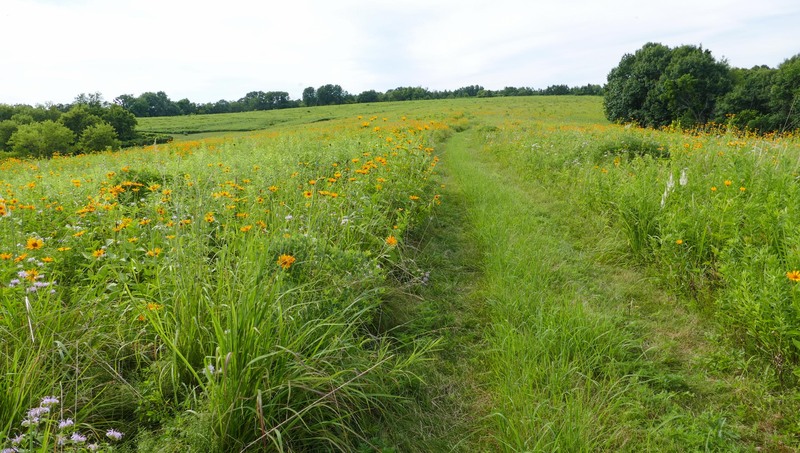 We did our annual butterfly count last week – a very hot day. It wasn’t too bad in the morning, but the afternoon was so hot that we decided to drive the EV instead of walking. 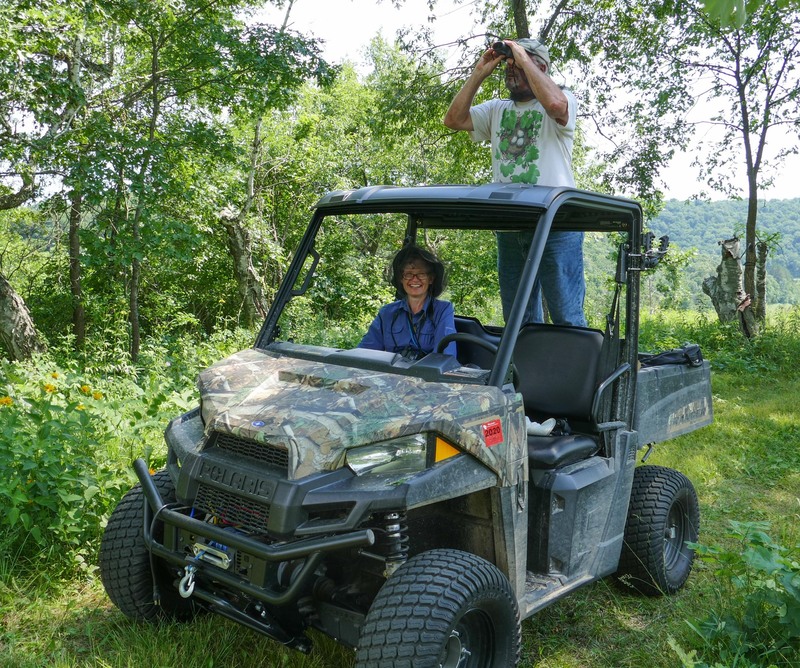 It turned out to be a perfect vehicle for butterflying – quiet, stops and starts easily, and open enough so we could spot the butterflies. Mike Reese thought the back was pretty comfortable. 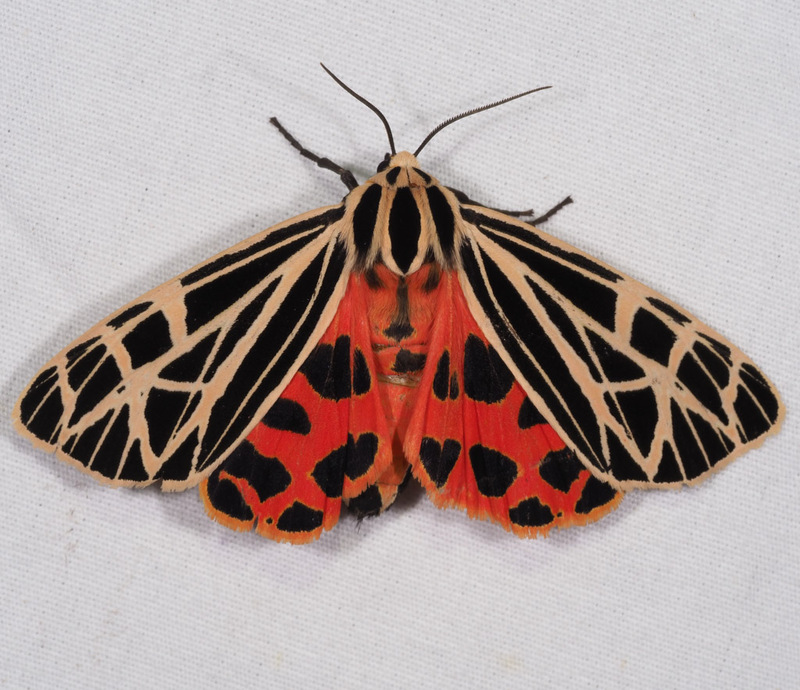 But most of the time he was standing up, scanning for butterflies. Kathy in the passenger seat, Mike scanning. 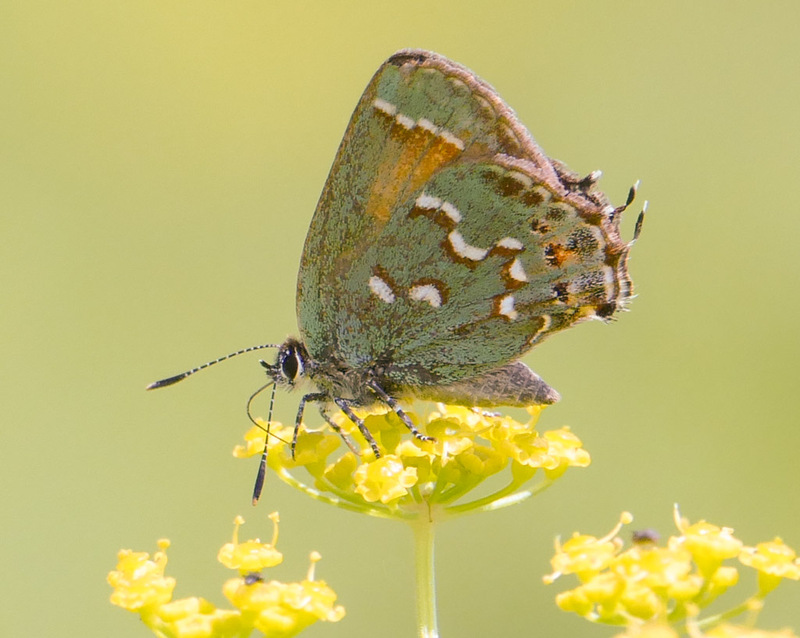 The best butterfly was a new one for the farm – a Juniper Hairstreak. Mike and Kathy found it nectaring on Wild Parsnip. 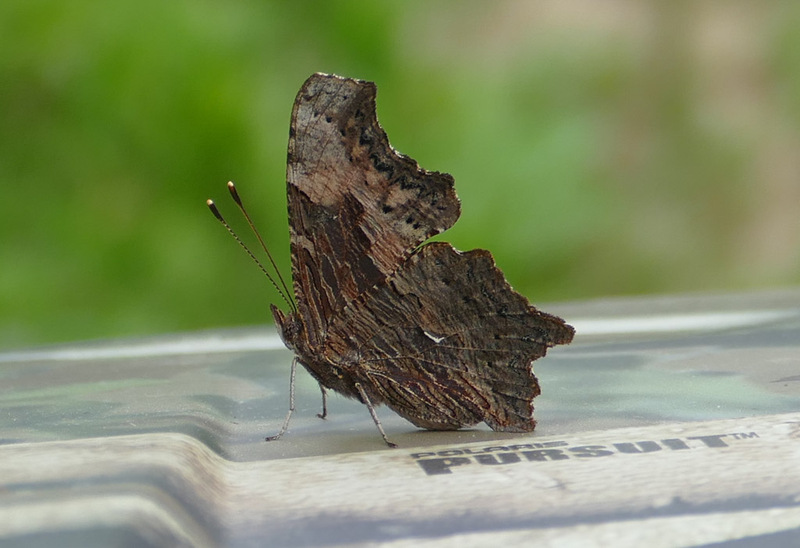 A Gray Comma rode along with us for a while, on the front of the EV. 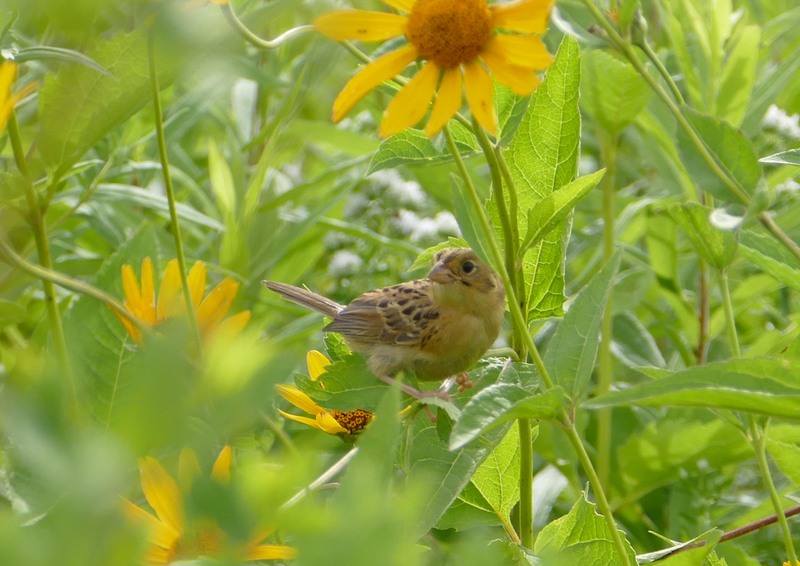 And a Henslow’s Sparrow inspected us from a Wild Indigo stalk. 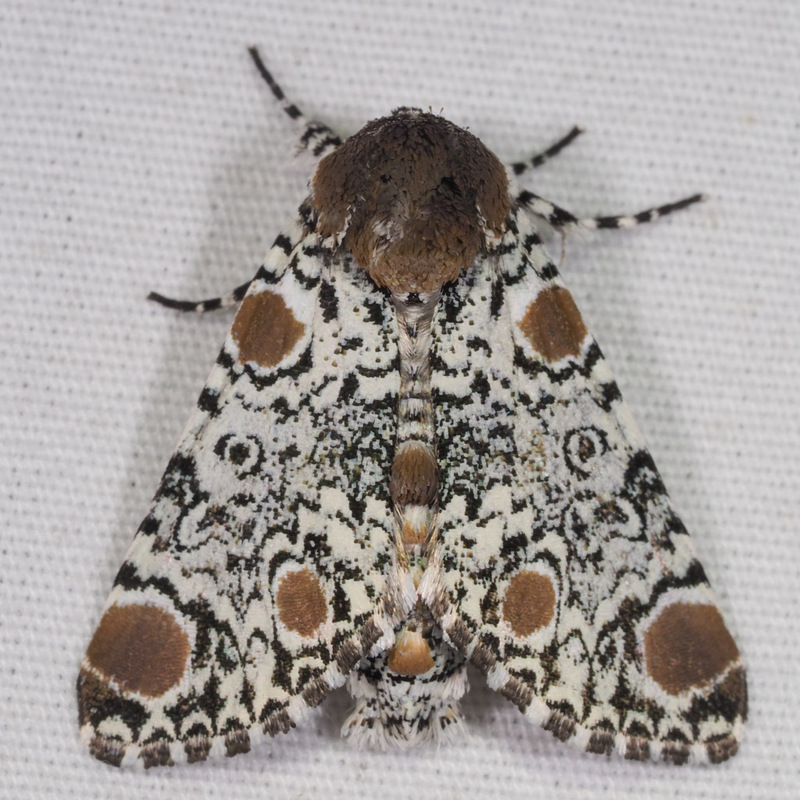 Click here for our species list from the count. 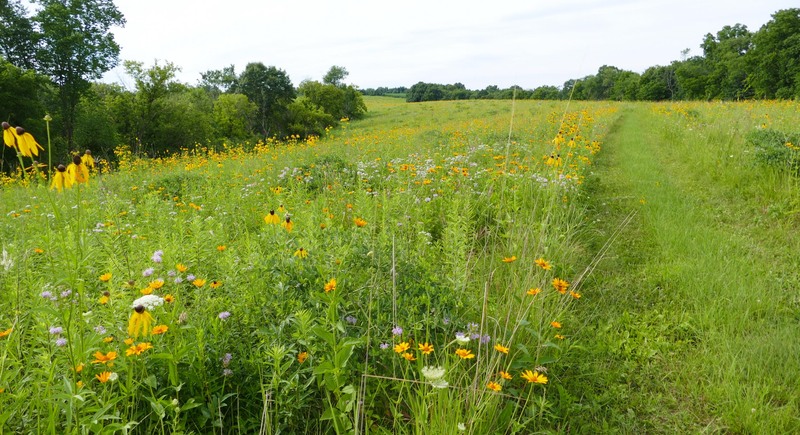 Buffalo Ridge Prairie is our prettiest prairie this year – full of flowers and butterflies. 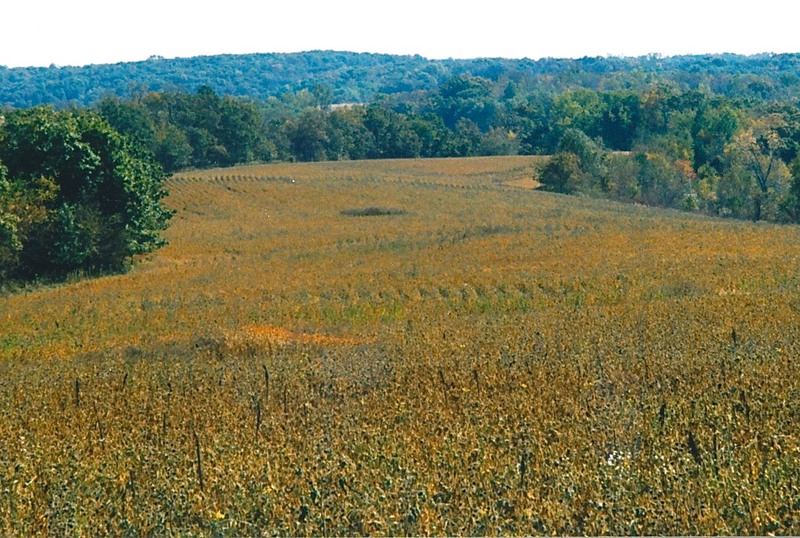 It’s fun to think of the way it looked before we started – here it is as a bean field in 2000 or 2001. And here’s a similar view from a few days ago. 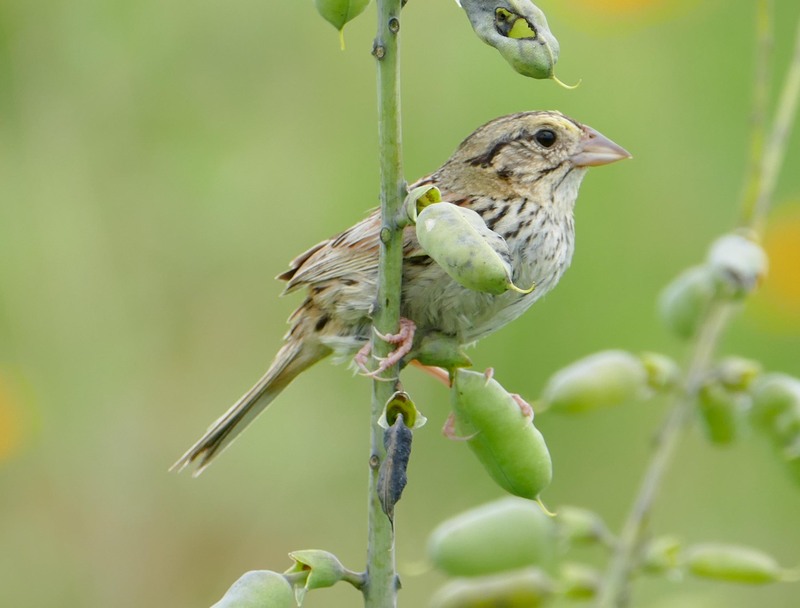 Buffalo Ridge is the prairie where the Henslow’s Sparrows nested. We saw one of the babies yesterday – hiding in the flower stalks. 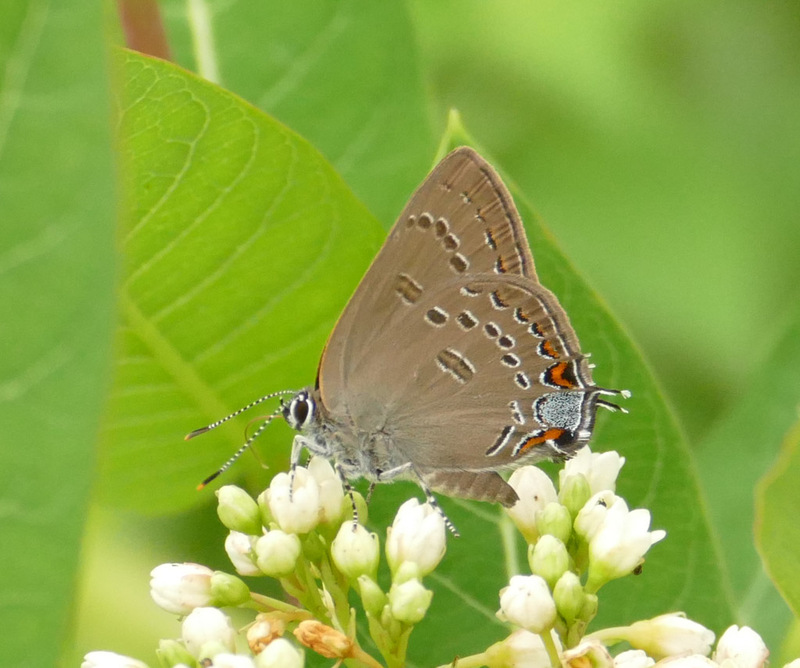 It’s been a good summer for butterflies. 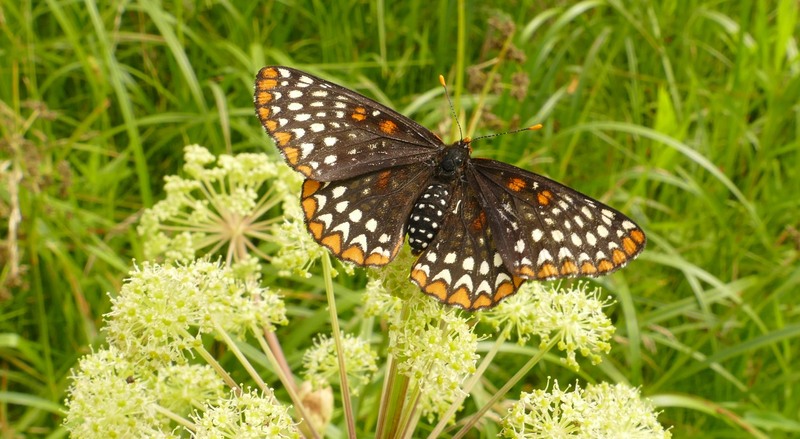 This is a Baltimore Checkerspot nectaring on Angelica. 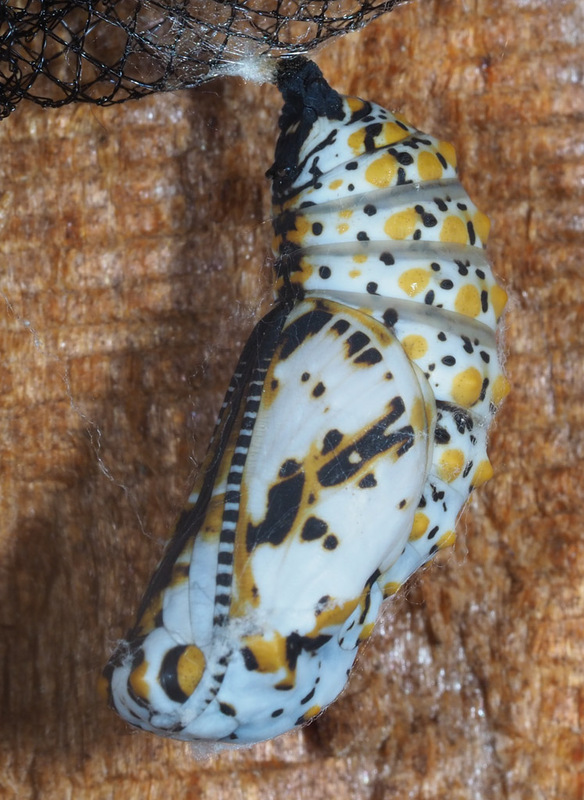 Baltimore Checkerspots have beautiful, elaborately decorated chrysalises. 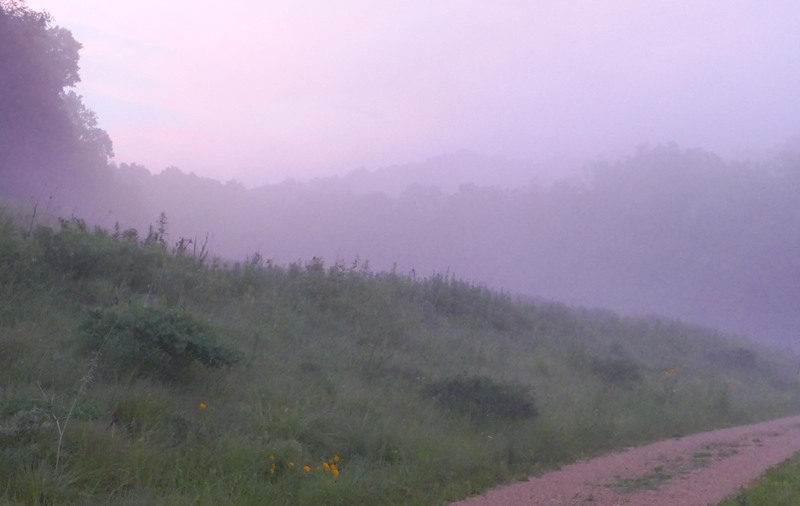 For a few weeks, at the end of June, we had hundreds of butterflies on the driveway. 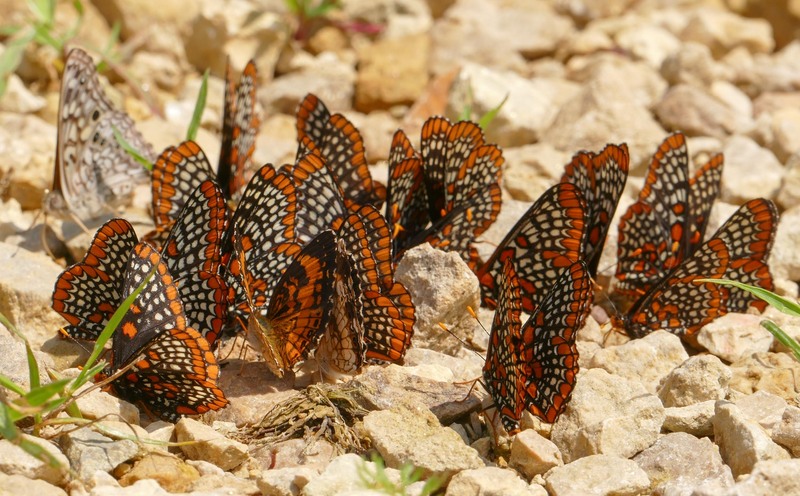 This was a particularly gorgeous group – mostly Baltimore Checkerspots, one Hackberry Butterfly, and two Silvery Checkerspots. 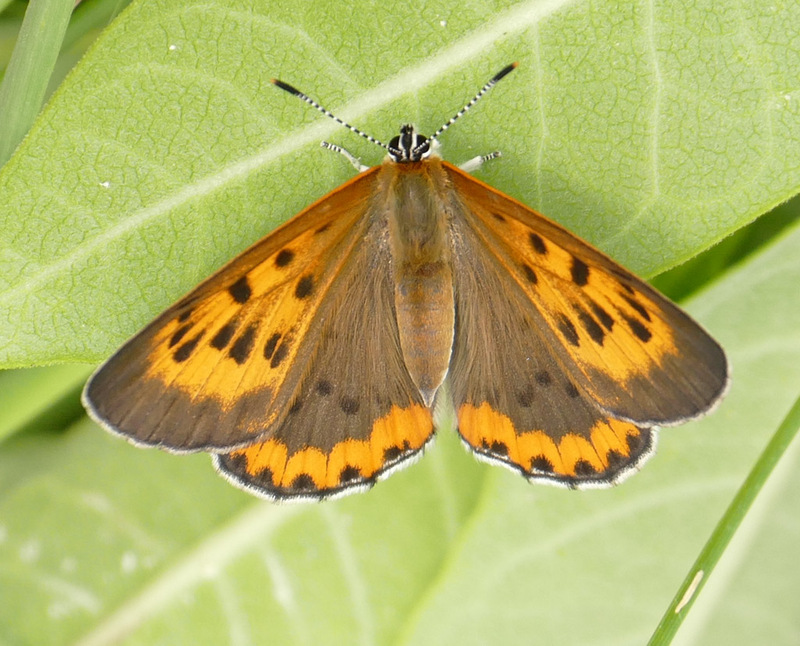 I found several female Bronze Coppers in the wetland while I was pulling Parsnip. 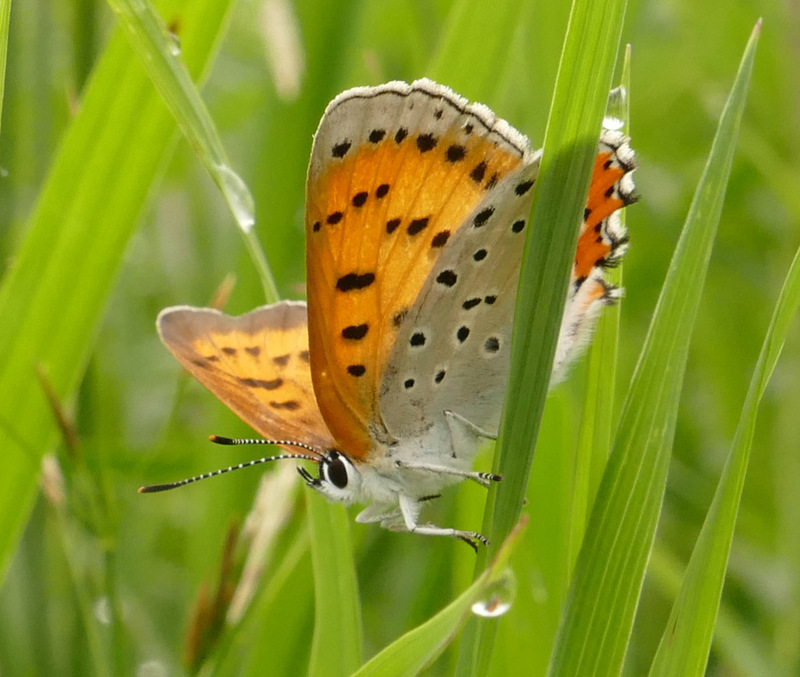 Another female Bronze Copper. 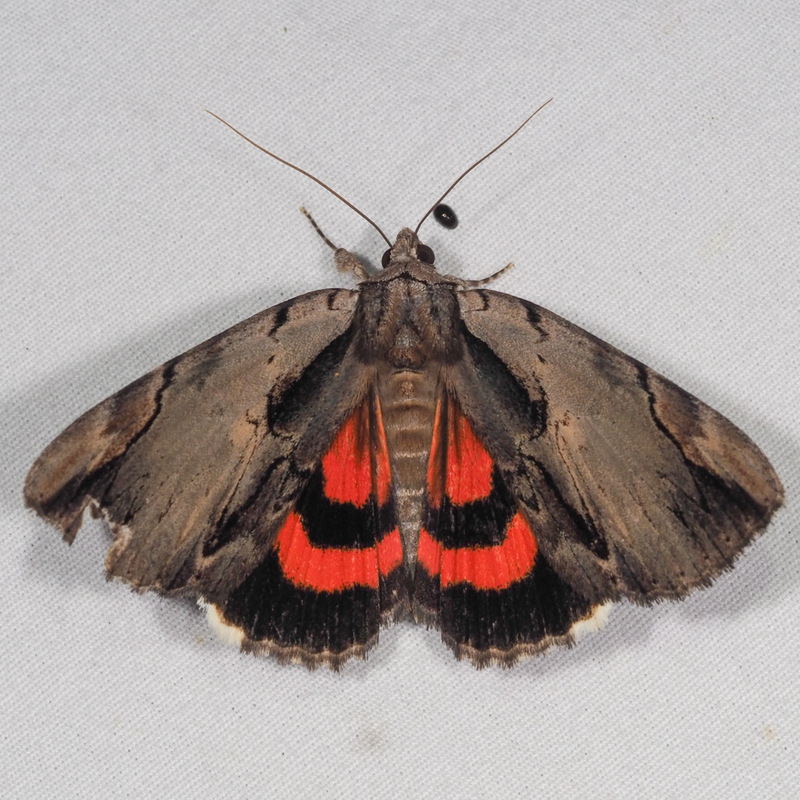 The males don’t have the copper colored area on the top of the forewings. 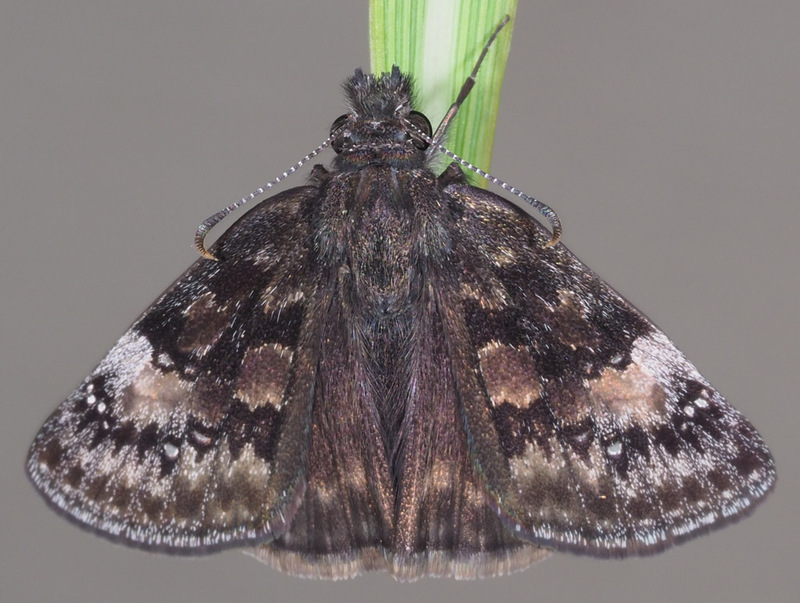 This is a Columbine Duskywing that I reared from an egg laid on one of the Columbine plants near our back door. Here are a few of the odd looking insects I’ve been seeing. 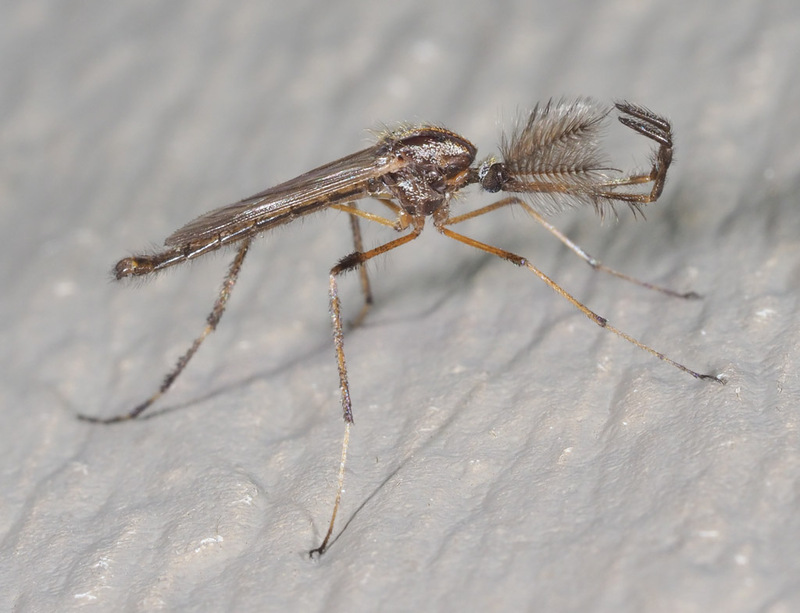 This is a male mosquito called a Gallinipper. It’s one of the largest mosquitoes in the U.S., but not very common. 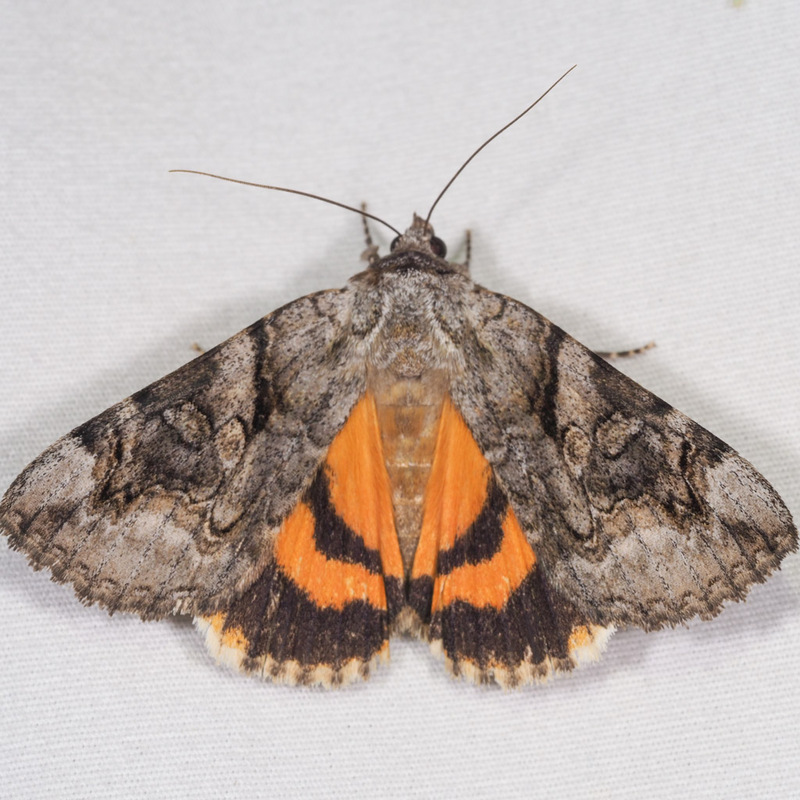 Its larvae eat the larvae of other mosquito species – so it’s probably a good one to have around. This is a tiny robberfly, eating its even tinier prey. 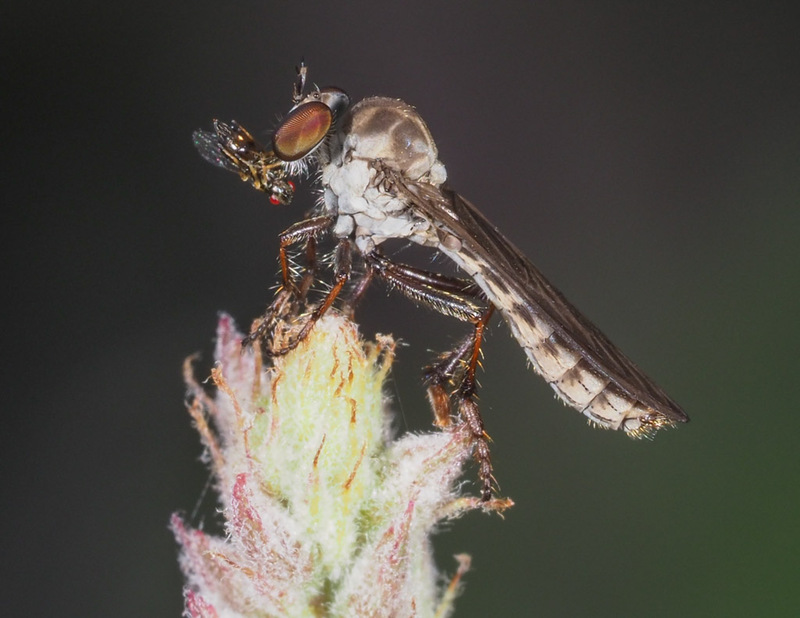 The robberfly is less than 1 cm long. 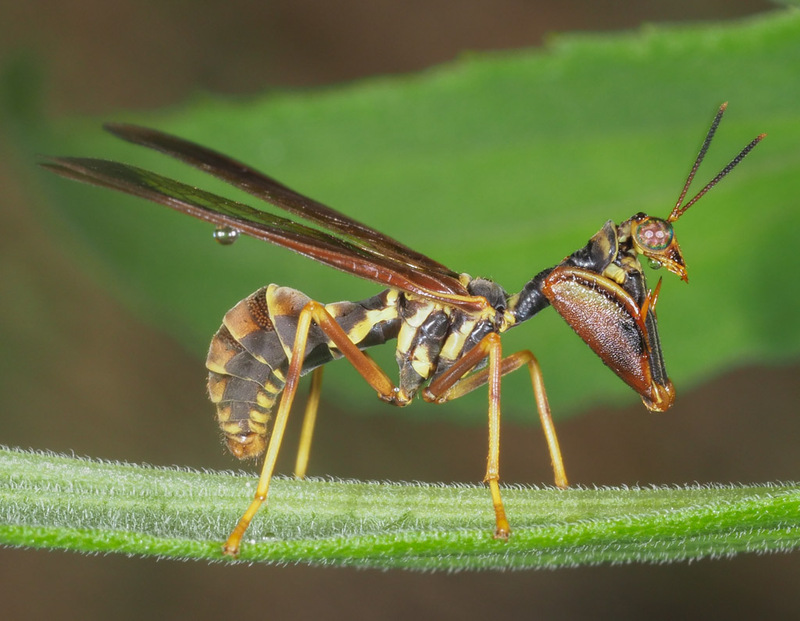 This is my favorite – a Wasp Mantidfly. It’s actually not a wasp, or a fly, or a mantis. 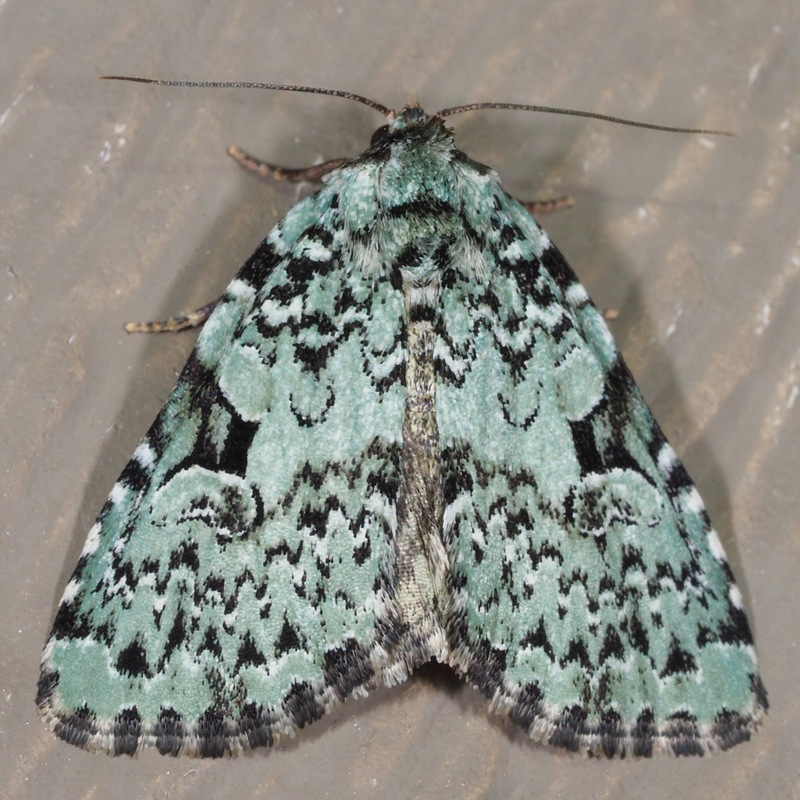 It’s in the Order Neuroptera – Net-winged Insects. 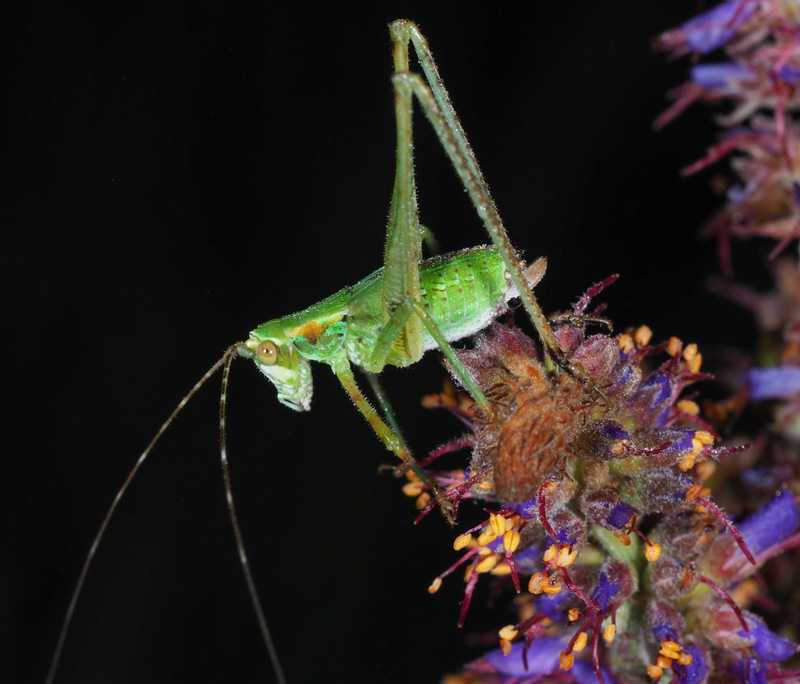 But it looks like a miniature praying mantis. It’s about an inch long. 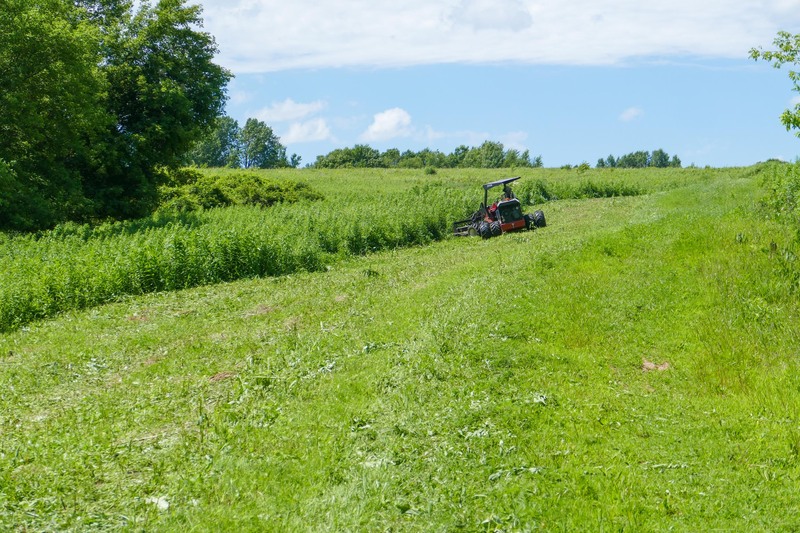 Mike did our first mowing of the two prairies I planted last winter – this one is Volvo Meadow. 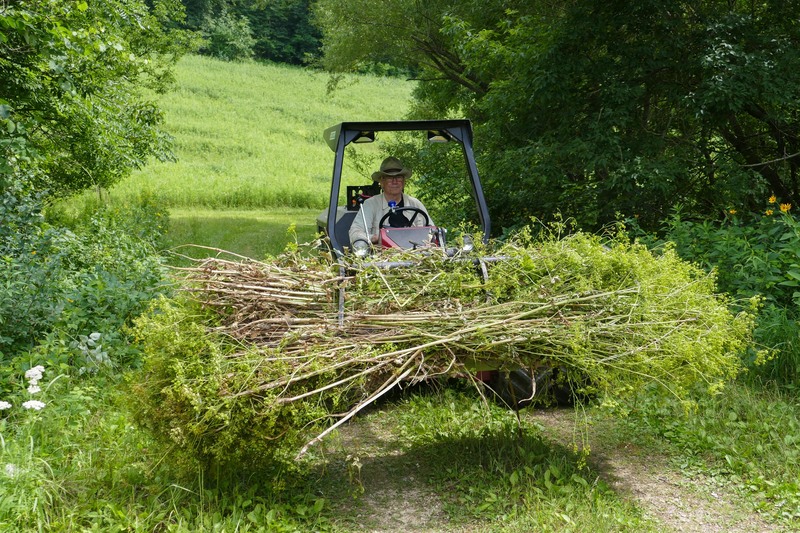 My big project has been pulling Wild Parsnip. I’m at the very end – I think I have one more morning to go. Mike helped me pull some of my piles out of a field near the old farmhouse. 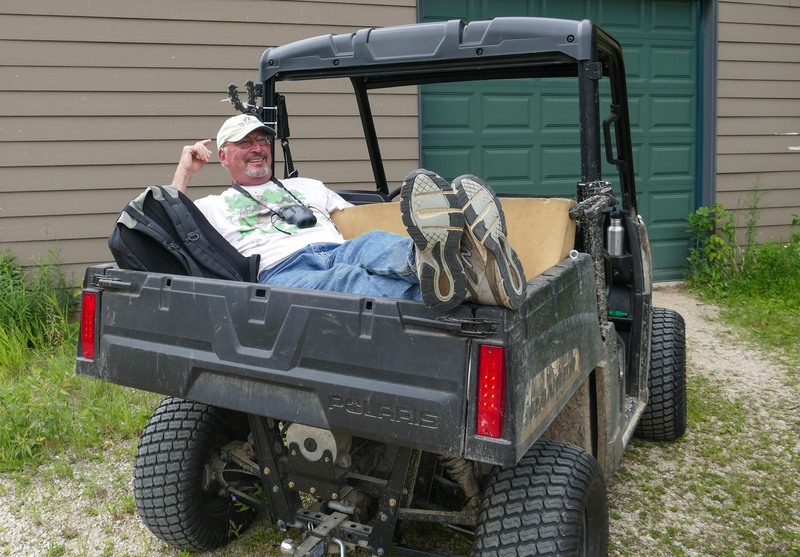 It was too wet for the EV, but Mike made it (barely) in his tractor. 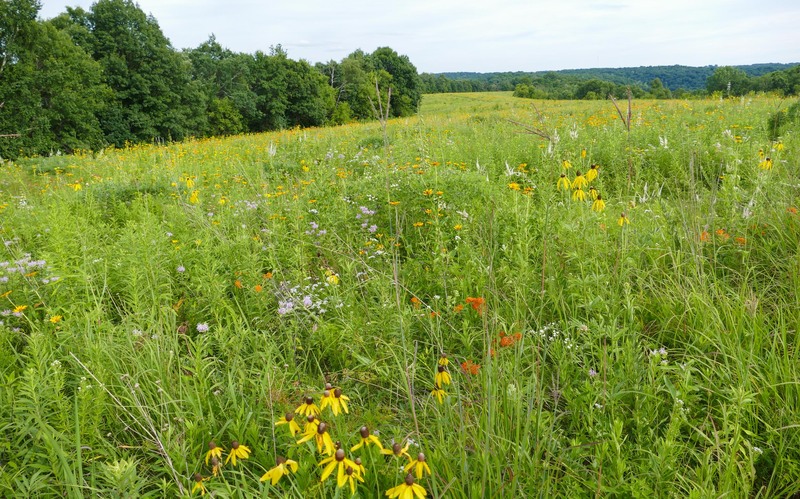 This is the field where I was working. 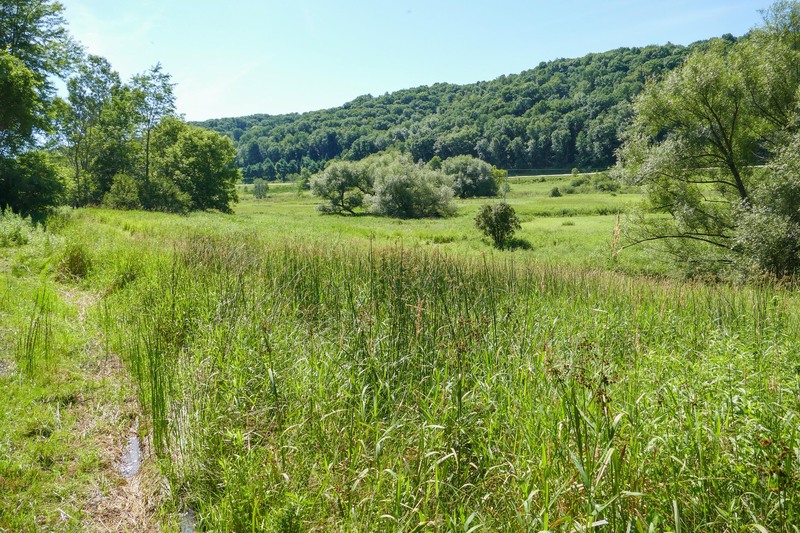 It’s weedy, but I’m hopeful that I can encourage sedges and other wetland plants to take over. 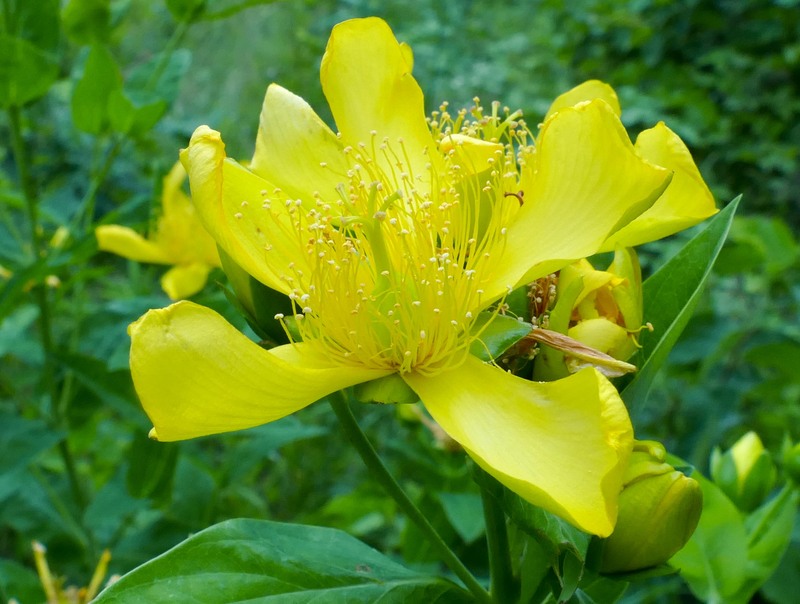 Giant St. John’s Wort – the flowers only last one day.